This photograph shows a ``hedgehog'' magnifier being held under a fluorescent task lamp, with additional ambient light from a window. In practice the lamp's reflection can be reduced by better positioning. This type of LVA is ``stood'' on the page (``the hedgehog'' has ``feet'' which are not seen when viewed from the top), and it has an aspheric (non-spherical) curvature which reduces image distortion over a larger area than a normal lens-based magnifier does. 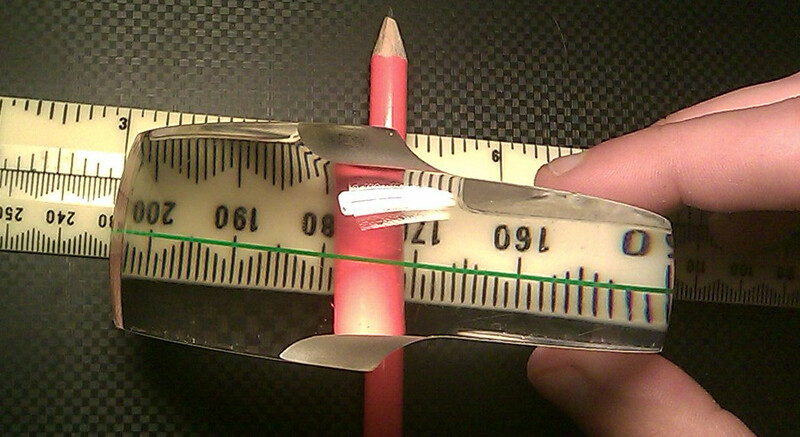 Some distortion is still present in this picture because I wanted to show the magnifier's effect on a ruler and a pencil, and it was hard to hold it flat over these three-dimensional objects; it's better when rested on a printed page. The magnifier seems to be made from some kind of acrylic plastic. I once dropped one at an outdoor conference venue; it bounced down a flight of steps (gradient was about 30°) and then an attendant caught it in mid-air like a ball. The impacts had severely limited its visual clarity (I replaced it soon after), but it more-or-less stayed in one piece. Chipping can occur with daily use; I try to keep my best one at home and use another for carrying, as some `bumps' are inevitable. The Hedgehog's magnification is advertised as 4.25x (often rounded up to 4.3), which must be an area factor rather than a scale factor (the corresponding scale factor is 2.06; perhaps the sales team preferred to quote the higher number). It's not mathematically possible for unpowered lenses to magnify much more than this unless the viewing area is reduced; video magnifiers can do better but they require power. Fresnel-lens ``full page magnifiers'' don't usually reach the Hedgehog's level of magnification, and lack the ability to double-up as a ``pointing aid'' for readers with gaze-tracking issues (nystagmus etc). In this picture, the magnification factor is not constant because (as mentioned above) the magnifier is not being rested flat. The leftmost millimetre seems barely 1.3 times as long as the unmagnified ones, while the scale factor on the far right exceeds 4.3! It's difficult to achieve this in practice however---normally the reader would simply place the magnifier flat on the text and use it as designed to get a fairly constant scale factor of 2.06. I'm not sure why these things are called ``brightfield'' magnifiers. Bright field microscopy involves lighting a microscope plate from behind, so that objects appear dark against a light background (field). I suppose brightfield magnifiers are named because they tend to concentrate incident light on the area being magnified; they certainly don't require lighting from below. The search term "brightfield magnifier" should retrieve some alternatives to the Hedgehog, such as the 1.7x and 2x dome magnifiers made by Schweizer, COIL and MagnaBrite, which can be cheaper if you don't need the extra bit of magnification provided by the Hedgehog, or the Eschenbach stand magnifiers, which slightly exceed the Hedgehog's magnification but are harder to obtain in the UK (and the last one I had tended to scratch at the base because it lacked the Hedgehog's ``feet'', although I'm told Eschenbach have somehow mitigated the scratching issue since then). People who are registered blind or partially sighted may be exempt from VAT and postage costs on specialist magnifiers. I used to buy Hedgehogs from Optima in Totnes, but in mid-2017 Optima said they've been discontinued so I went to Edward Marcus Ltd (IC Online); they're also listed by QuickTest, or try a general search for "hedgehog magnifier" (or "brightfield magnifier" for other types). When I checked in 2017, QuickTest's protocol for proving your eligibility for VAT exemption involved filling in an electronic form in a proprietary Microsoft Word format that didn't work on LibreOffice, but Edward Marcus were happy with a simple text-only explanation in the online ordering system's Comments field and the magnifier arrived in 2 days. I've sometimes been asked where to buy a Hedgehog in East Asia; sorry I don't know, but they're light to take in hand luggage. Perhaps Lesa should open a market over there; may I suggest the Chinese name 刺猬cìwei 放大镜fàngdàjìng. I wrote this page because I sometimes get questions about the Hedgehog I use. Usual disclaimers apply; it does not constitute medical, legal or financial advice.